Depends on what fix you need, but seriously, there's no need to be handy to effect repairs on old wooden windows. If it's the glass, you need to be able to play with silly putty. If it's the rope and weight, you need a large screwdriver (to open the case, no doubt sealed shut with paint) to access the weight, and new clothesline. If they're stuck a lot, you may need to do some sanding or planing, which is just muscle work. If they need to be stripped and repainted, that's nasty but not at all technical. Any handyman service could do any of those things, but don't decline to do it yourself just because you've decided you're not handy. Occupy your windowsill! Just be careful if you sand or heat to remove old paint - might be lead containing. Best to scrape wet if you scrape. You can take a chip to a lab to be tested for lead. Above link gives names of labs that can do this. Costs about $30 a sample. If you only need a couple windows done, that's probably a job for a general handyman. If you have many windows that need doing, including possible reglazing, repainting, recaulking and/or weatherstripping, give a call to Lindop Carpentry. They do great work on any kind of restoration project, are reasonably priced, hard working and honest. All good comments from Carl. For an added benefit, you should use cotton sash cord instead of clothesline because the latter may have nylon in it and nylon over time gets brittle and won't last as long as the cotton sash cord, typically found at local hardware stores rather than the big-box stores. If you're still looking for someone to repair your old windows, let me know as I will occasionally hire myself out to do this type of work that I've done on over 100 windows between about 4 historic homes I've owned or have been hired to work on. If you'd like to learn more about this, I am running a wood window repair workshop through Historic Albany Foundation on April 21st, 10am-1pm which offers "how-to" and some hands-on demonstrations on window repair, efficiency improvements, some cautions when working on older windows as mentioned above and doing it for less than the cost of a replacement window. You can make a reservation for the seminar through Historic Albany Foundation, or if you still would rather hire it out, let me know. jda2aia@gmail.com. I didn't think of lead . . . in the sense that I assume that if you have wooden windows, you have lead paint. So yes I'd work wet and use a good respirator . . . which is still not a big deal to do yourself, though respirators are damned uncomfortable. And I do apologize for saying "clothesline," because yes there is real sash cord in any real hardware store. I was just about to recommend seeing how it's done first, specifically because I've seen Jack's presentation! I still haven't done any windows myself, but without seeing Jack and how easy he makes it look, I wouldn't even know where to start. here is a workshop the Historic Albany Foundation will be holding. Join Historic Albany for a workshop featuring hands on window repair techniques. Jack Alvarez of Landmark Consulting will teach you how to remove, repair, and rehang your wood windows. Learn the tools and techniques you will need to return your windows to their former beauty! Reservations required as space is limited. For more information or to reserve your spot, contact Genny at 518.465.0876 x10 or gfaist@historic-albany.org. Maisie, first of all, real props to you for wanted to have these windows repaired/restored. Like so many other things about old homes, they don't make 'em like they used to! Carl and Jack have said it all and I don't know what your particular issue is, but if they're just painted shut you can always just open then by cutting the sealed paint with a boxcutter/utility knife and then gently slide a putty/joint knife between the window edge. I know you said you're not handy but that takes zero skill--just a lot of patience and elbow grease. Years ago we got the name of a window "guy" from the Historic Albany Foundation and he actually came to the apartment we lived in to unseal the windows. (maybe it was Jack?!) So you might want to call them and see if they can recommend someone, too. The workshop from Historic Albany Foundation is awesome. Not only did it teach me how to work on wood windows but also educated me on their value. They are gems. I love the sound they make when I open and close them. Jack's comments are right on and the workshop sounds awesome. Just want to add/clarify that working with the weights will likely involve removing the trim around the windows which needs to be done carefully if it's an older house. Also, keep in mind that you can replace the old windows with new ones that look the same but are far more energy efficient. We did this in our 1880 Saratoga house after concluding that most of the old windows were just too warped and/or drafty to keep. You can donate the old windows to the HAF's architectural parts warehouse, or use them for a greenhouse or coldframes, or take out the wavy glass and do something interesting with it. Old hanging weights are also very cool, as paperweights if nothing else. At "Burnt My Fingers" I would beg to differ that your new windows are "far more energy efficient." On a cold day, touch the glass...it will still be cold. 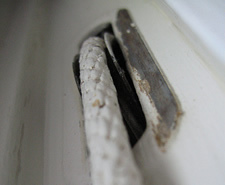 Furthermore, no window trim or casings should EVER need to be removed if there are window weight access pockets located within the window jambs... only the window stops which are the small trim pieces that keep the lower sash in place against the parting beads should need to be removed. The window manufacturers have misled the public to believe that their new products are much more energy efficient than original wood windows when in reality, so many very good, repairable windows have been sent to the landfills and have been exchanged for windows that will only last 20-25 years at best. The windows that Maisie is asking about are from the 1920s (over 80 years old and still functioning and could continue for another 80 years with some care and maintenance at a fraction of the cost for new windows!) The seals and gaskets in new windows are not repairable, so when they fail (and they WILL fail) the result will be drafty windows again with no way to repair them...they will need to be landfilled again at far greater cost for replacement than to have had them repaired in the first place. In an 1880s home, the windows are even more valuable because the wood used in those windows was superior to most anything out there today. "Warping" was rare in that era of wood and it was most likely a case of loose trim or a window in need of weatherstripping. The HAF warehouse is so full of windows at this point, I can't imagine where they would put anymore. And those were the "lucky" sash that didn't get carted to the landfills. The wholesale replacement of windows in this country must stop because we will be faced with ever increasing costs to re-replace the substandard windows that have evaded the marketplace in the last 20 years. The costs for replacement windows are expensive now and once replacement windows are installed, it begins a bad cycle of every 20-25 years where windows will be landfilled and replaced at even greater costs. This is FAR from sustainable!